7 February 2019 PolarConnect, Live, From Observation Hill Of Ross Island, Antarctica...amazing!! Submitted by Kevin Dickerson on 7 February 2019. Dr. Byron Adams and I during our PolarConnect event. Antarctic winds blasting around Observation Hill onto Dr. Adams and myself. Temperatures in the teens. We were overlooking the iceberg-choked Ross Sea and the McMurdo Station. Best of all...you were able to join in and be there with us. A special thanks to the IT staff here at the McMurdo Station. They have been so wonderful to help with any technology needs I have had here in Antarctica, and believe me there have been plenty of needs. They have fixed my GoPro camera, helped with all of my Skype sessions, and have offered so many suggestions to help make the PolarConnect event an awesome success. The amazing ladies on the other end of the connection also need a big shoutout. Janet Warburton and Judy Fahnestock, from PolarTREC made this all possible from their remote locations putting it all together. 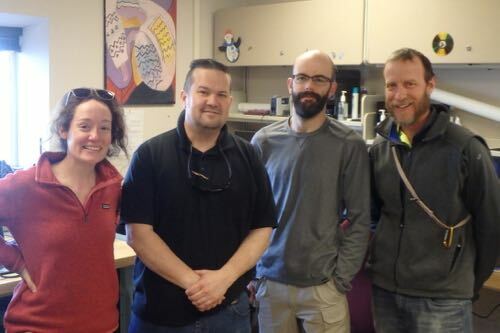 The amazing McMurdo Station tech crew, made up of Carrie Piesen, Tim Lynch, and Kevin Brown. 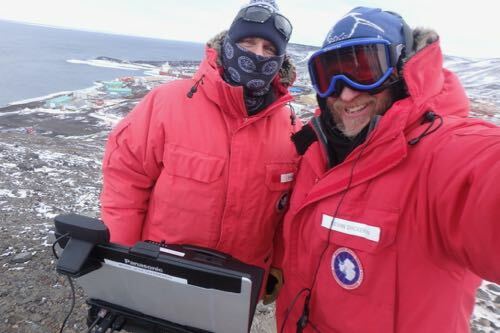 Dr. Byron Adams and I were able to be up on Observation Hill overlooking McMurdo Station and the Ross Sea, and do a live video feed to people all over the country. We had so much fun chatting with all of you. The temperature was low and the wind was high, just the way we like it here in Antarctica. There were times when it was hard to hear because of the rippin' wind...I wouldn't have wanted it any other way. If you missed it, it will be archived on the PolarTREC webpage. Check it out. For those who joined our event, you had a chance to meet Dr Byron Adams. He is such a dynamic speaker, and over-the-top scientist that people love hearing his entertaining presentations. I have a special treat for you. Dr. Adams was a featured speaker here at McMurdo Station Sunday night and I video taped his 30-minute presentation about the toughest animals on Earth. Watch his video to learn about the only animals to be able to not only survive, but to flourish, in one of the harshest places on Earth...the Dry Valleys of Antarctica. All good things must come to an end. Our expedition is winding down. We have four more days until an Air Force C-17 flies us off the ice. That gives us the perfect amount of time for you to officially meet the rest of our Dry Valley Soil Ecosystem team, known during this entire expedition as the Wormherders. You will meet Alyssa, Tasha, Dr. Powers, and Dr. Adams. Be sure to stay tuned to future journal entries as each of these amazing scientists take over my journal for a day. I’m excited to meat the rest of the team and you’ll need to tell us more ween you get back to school. Have you been supper cold well you’ve been there? The rest of the team are amazing folks. You will really enjoy hearing from each in the journals. Yes, it's pretty cold here. Sometimes we really have to think ahead to get our field research done, but not totally freeze your fingers. We use hand warmers in our gloves and alternate which hand will be exposed to the cold. We have really warm clothing so it works great. We miss you and your amazing and cool you have been sutch a great teacher and I hope your having fun good luck on your last few days. Have fun. Thanks. I'm glad I'm being missed. I am excited to share some of these great experiences I'm having and the neat things I'm learning. Weather Summary: Skies partly cloudy. Perfect day for a live video chat back to the U.S.